This is a weird one, in that it brings up the age-old question of whether two wrongs can make a right. On one hand, it's easy to argue that banning an article of clothing (particularly one that may be mandated by a religion) is a violation of citizen's rights. On the other hand, it can be convincingly argued that the affected religion is one that can not co-exist with the values of its host society. The ostensible rationale for a burka ban would be to stop the spread of an ideology that forcefully violates the freedom of others... through the enforcement of a freedom-violating ideological mandate. 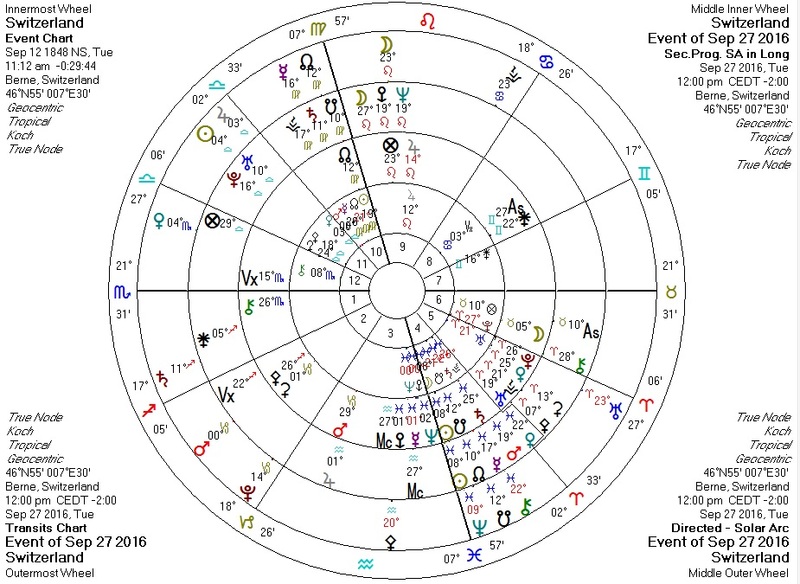 The astrology against Switzerland's national chart for the day of the vote is as fascinating and unsettling as the fact of the vote itself. Transiting Jupiter/Sun conjunct Switzerland Venus in Libra: femininity made public. Transiting Pallas trine Switzerland Pallas and quincunx Switzerland Sun and North Node, progressed Pallas square Switzerland Mercury: very significant libertarian vectors at play. Transiting Pluto square Switzerland Pallas: one authoritarian vector. This is significant, but it's also worth noting that the libertarian factors are much more numerous and stronger. Is the universe telling us that this action will fundamentally result in more freedom/peace/non-aggression than the reverse? If so, do two "wrongs" indeed make a "right"? Transiting Neptune and progressed Sun conjunct Switzerland Moon in Pisces in the Fourth: highlight on the intersection between spirituality, culture, femininity, and perhaps race. Transiting Chiron conjunct Switzerland Saturn in the Fourth: injury plus authority plus culture. Switzerland Uranus return in the Fifth House: an impending shift in the nation's identity expression? Switzerland will (along with Hungary and others) be a place to observe and compare with the rest of Europe as Islam grows in influence on the once-Christian continent.